Five years after the retirement of Harry Potter, we now see the rise of the Fantastic Beasts, and the opening chapter of this newly calculated franchise easily preaches to the converted, quenching their hunger for large-scale magic and mayhem. Everyone else (like me) who weren’t enamored with the earlier movies, aren’t going to find anything fresh or entertaining here either. Set in New York in the mid 1920’s, we see quirky, eccentric wizard Newt Scamander (Eddie Redmayne) arrive on its shores by ship (in a scene that cries out for a cameo by Vito Corleone), hoping to acquire a certain creature for his extensive collection. Having already travelled the globe, Newt is studying these bizarre critters in order to create the definitive textbook, so they won’t be feared or misunderstood by a sometimes ignorant community. 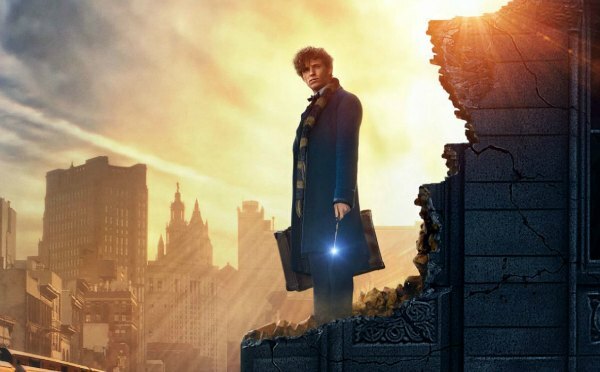 Unfortunately, Newt’s visit coincides with a series of mysterious incidents that are plaguing the city, and when some of Newt’s subjects escape, they are deemed responsible and targeted for termination by the Magical Congress of the United States of America, headed by President Seraphina Picquery (Carmen Ejogo). Helping Newt discover the truth behind the chaos is former Auror (or wizard investigator) Porpentina Goldstein (Katherine Waterston), her flirtatious, telepathic sister Queenie (Alison Sudol), and bewildered mortal (or No-Maj) Jacob (Dan Fogler). It is a race against time, as well as Security Director Percival Graves (Colin Farrell), because if the group fails, Newt’s unique subjects will disappear forever. Fantastic Beasts and Where to Find Them closely follows the style and formula laid down in the Harry Potter films, particularly the latter entries. This isn’t surprising, as David Yates helmed the final four instalments, but by not giving this prequel its own distinctive identity and look, it feels more like a continuation of the series rather than a set-up to it. In fact, you expect at certain points for Harry and his friends to turn up and give Newt a hand, so a lack of invention eventually becomes irritating. What also stands out as the film continues is its derivative content. Like the recent Dr. Strange, a list of other films and shows start to accrue, and rather oddly, two of the same movies raise their heads here. Wizard law enforcement act and look very similar to the shadowy agents in The Adjustment Bureau, and a major act of time reversal (along with accompanying consequences) will strike a chord with fans of Superman 1 and 2. A more apt description however would be Ghostbusters-meets-Jurassic Park. An underdog team try to combat mysterious forces attacking New York City, and an exotic collection of creatures escaping their enclosure (the zoo on this occasion being a tardis-style suitcase), causing varying degrees of havoc. Even the tension between the human and wizard world has echoes of X-Men. Screenwriter Rowling makes some well-intentioned attempts at social and political commentary (striving for the comparable impact of Good Night and Good Luck), but the result is clumsy and heavy-handed (a nod towards the approval of gay marriage is a perfect example), making its fanciful story lead-footed on an increasingly frequent basis. The elaborate, non-stop CGI effects never inspire a sense of awe and wonder, and actually become deadening after a while. Production values are typically strong, but also strangely indifferent, blurring with the dozens of expensive Hollywood blockbusters that fill our theatres now. Oscar-winning Redmayne (The Theory of Everything / The Danish Girl) overdoes Newt’s awkward, child-like mannerisms, leading to a performance that seems more mechanical than endearing. The entire cast suffers though, locked into skeletal characters who will hopefully be fleshed out over the coming four sequels. Waterston (Steve Jobs / Inherent Vice) barely registers as Porpentina, Farrell seems to be going through the motions as Graves, while Sudol (Transparent TV series) is bubbly but nothing more as Queenie. Samantha Morton (Movern Callar / In America / Control) and Ezra Miller (Afterschool / We Need to Talk About Kevin) do rise above the one-note roles given to them, but other actors like Jon Voight (Heat / Midnight Cowboy) and Carmen Ejogo (Selma / Born To Be Blue) are nothing more than set decoration. I understand the nature of a movie series, but the first instalment still has to work on its own terms, and too many characters are introduced and discarded, leading to dull personas and dramatic disconnect. Only Fogler manages to muster up any kind of genuine emotion, despite the fact that his character is really nothing more than a series of reaction shots. It is also hard to see him playing someone so affable and sweet, after witnessing his turn as an outrageously debauched priest in the amusing 2012 horror / comedy Hellbenders. Rowling and Yates had the opportunity to expand their fanbase with Fantastic Beasts and Where to Find Them, but all we get instead is a safe, by-the-numbers retread. What could have been an imaginatively tooled new universe is disappointingly something we’ve seen a number of times before, a burgeoning journey where we are already comfortable in the passenger seat. Conversely, for the millions of Harry Potter fans out there, you will take to it like a fish to water.